As the name would suggest, the Talbot-Lago T120 was the baby brother of the marque’s legendary T150. Just because it wasn’t as large, expensive, or powerful, doesn’t mean they didn’t have the ability to be just as beautiful. The T120 is powered by a 90 horsepower, 3.0-liter straight-six and was introduced in 1934. This car carries bodywork from Carrosserie Brandone and it is believed to be the only such body fitted to a T120 chassis. It has known history back to the 1960s when it was discovered in storage in Saint-Tropez. It was restored decades ago and has been a part of the Academy of Art University Collection for some time. It is expected to sell for between $1,050,000-$1,150,000. Click here for more info and here for more from Mecum in Vegas. 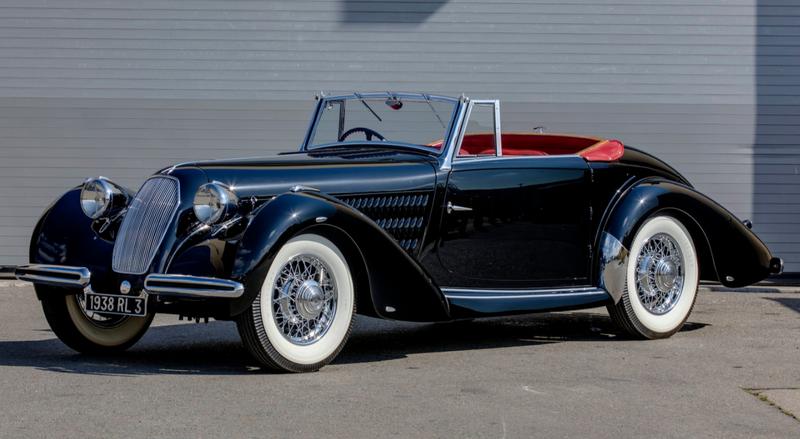 This entry was posted in Uncategorized and tagged 1938, auctions, brandone, cars, classic cars, mecum, roadster, t120, talbot-lago by classiccarweekly. Bookmark the permalink.